SCHD saw handsome dividend growth in Q1, reversing last year's dividend decline in the same quarter. The fund's yield and valuation are both more attractive than the S&P 500. With the indices retesting previous highs, now seems like a good time to move into more defensive positions. The purpose of this article is to evaluate the Schwab U.S. Dividend Equity ETF (SCHD) as an investment option at its current market price. With the run-up in the market in 2019, SCHD has seen a very positive return since my last review, but so have the majority of broad dividend funds. However, there are a few key reasons I think SCHD will perform well going forward. One, dividend growth in Q1 was impressive, helping the fund keep its current yield in the 3% range. Two, the fund is well-diversified, offering exposure to offensive and defensive sectors, which provides a nice mix of stocks. Three, with the market discounting potential headwinds such as escalating trade wars and rising oil prices, investors may want to begin to rotate into some defensive sectors in order to get ahead of potential future volatility. With almost a quarter of SCHD's holdings in the Consumer Staples sector, this investment is a smart way to do just that. First, a little about SCHD. The fund's stated goal is "to track as closely as possible, before fees and expenses, the total return of the Dow Jones U.S. Dividend 100 Index". The fund attempts to hold the same proportions of its stocks as its weightings in the index and is managed by Schwab. SCHD is currently trading at $53.55/share and, based on its four most recent dividend payments, yields 2.86% annually. SCHD is a fund I regularly review because I own it, and I continued to recommend it at the start of the year. This turned out to be a timely call, as it is up over 15% since that article. Of course, while this was a profitable trade, the broader S&P 500 is up by a slightly higher amount in 2019, so SCHD has not provided much in terms of "alpha". That said, I view the year-to-date move positively and appreciate the more defensive nature of the fund as the indices re-test previous all-time highs. Clearly, this shows strong improvement, with 35% year-over-year growth. While I view last year's declining dividend as an anomaly, it is still important to see the Q1 2019 payout was almost 10% higher than the 2017 payout. This tells me that SCHD has returned solid growth over time and did not just return to its previous level after the decline last year. While the fund's yield is below the physiological 3% benchmark, this has largely to do with impressive share price appreciation and not because of an inability to grow the dividend. Therefore, I view its current yield favorably still, even if it is not "high". SCHD has shown consistent, stable dividend growth over time, and it is yielding a full percentage point higher than the S&P 500, whose current yield rests at 1.85%. Therefore, my takeaway is SCHD remains an attractive dividend fund, and its Q1 growth supports my confidence. My takeaway from all this is I like SCHD's diversification. It has enough exposure in cyclical names to benefit from a rising market, but it has a slightly defensive overall slant, considering 1/3rd of the fund rests in Consumer Staples and Health Care. While the market has been on a roll in the new year, whenever I see the indices approaching all-time highs, it is more often than not a signal that I should be getting cautious. It is therefore this defensive exposure that I am particularly attracted to for the short term, which I will discuss further below. I have been advocating staying long equities for some time, but I am still surprised at the momentum we have seen so far this year. As the markets heated up but rates stayed low, I began to advocate moving into higher-yielding sectors, such as Utilities and Real Estate. 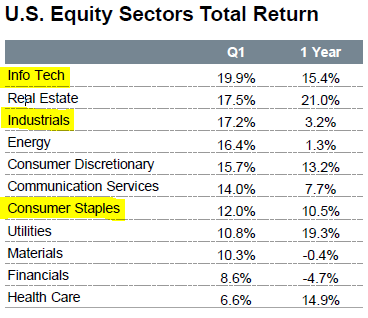 Those areas have also gone up, but it has been hard to gauge what overall strategy would have been best so far this year, as all sectors have seen gains. With this in mind, I am now advocating a shift to more defensive sectors, such as Consumer Staples, or funds like SCHD that have a high amount of exposure to them. While I still like the higher-yielding sectors, I believe defensive names will come in handy over the next few months. My reason for this is because I personally feel the market is getting a bit too euphoric. I recognize that corporate earnings have been roundly positive, employment gains have been steady, and the Fed is holding off on further interest rate hikes - all of which are net positives for equities. While I don't debate the positive impact on any of this (and have been recommending buying because of it), the market seems to have tuned out some geopolitical risks that I think will ultimately give us some short-term volatility. Specifically, while the U.S. continues to make progress with China, with respect to the present trade dispute, the relationship with another vital trading partner - the EU - appears to be heading in the wrong direction. Recently, there appeared to be positive progress in lifting recently imposed tariffs, with the EU working toward approving a mandate for the European Commission to negotiate cuts in industrial tariffs, in a move to satisfy Washington. However, this progress is now being complicated by a renewed interest in a decade-long World Trade Organization complaint from the U.S. about Airbus (OTCPK:EADSF) subsidies, with the EU filing a similar complaint about subsidies for Boeing (BA). As an escalation of this dispute, earlier this week, President Trump announced the U.S. is seeking tariffs on $11 billion worth of products from the EU. In response, according to data compiled by Bloomberg on Friday, the EU began considering imposing tariffs on U.S. products for a similar amount. These tariffs could impact a wide-range of products, including video game consoles, fitness equipment, casino game tables, tobacco, vodka, orange juice and food items ranging from chocolate to frozen lobster. While these new tariffs are not guaranteed to go into effect and are small in comparison to the tariffs on Chinese products, an escalation in trade disputes is not timely, considering we were finally turning the corner with China. While the impact on the market shouldn't be too large in isolation, a worsening of the overall relationship between the U.S. and the EU could cause some anxiety, and with the market at such high levels, investors may not need much of an excuse to sell off. I just discussed some geopolitical issues, all of which could impact the American consumer. Furthermore, as these tensions rise, investors could start to become nervous and seek short-term shelter in defensive sectors. Consumer Staples would be a key theme if this does play out, because costs would likely rise on many products sold domestically. While this could dampen overall consumer spending, the "staples" corner of the market should fare better than more discretionary sectors. As prices go up and consumers cut back, they will differentiate between "wants" and "needs", and likely scale back on the "wants". As prices at the pump go up, Americans will begin spending a larger percentage of their take home on gasoline. This could force them to cut back on spending elsewhere, but demand for the household, personal care, and food and beverage products in the Consumer Staples industry should hold up just fine. These are products consumers need in good times and bad, and the steady demand for these items helps lift the sector when other areas are struggling. Overall, this is a pretty solid report, and PG has actually performed very strongly in 2019 on the backdrop of this performance, seeing a share price gain of about 15%. My point here is that SCHD has the right type of defensive exposure investors will want if the market turns around, especially if consumers are forced to cut back on discretionary spending due to tariffs and/or rising gas prices. My bullish case for SCHD back in January was well-founded, and the fund continues to deliver enticing returns with a growing income stream. With a diversified portfolio, a dividend focus, and defensive exposure, this is exactly the type of investment I want to be adding to as we hit market highs. While the indices could certainly move upward from here, I want to be cautious. To do this, I am going to focus on equity funds that may lag during good times but can play defense in volatile times. The exposure to the Consumer Staples sector should help prevent excessive volatility and should not be impacted by rising oil prices or tariff implementation to the same degree as discretionary sectors. With the Fed pausing on interest rate hikes, dividend funds are going to be my focus for the foreseeable future, and SCHD is one of the best. Therefore, I continue to add to SCHD, and recommend investors give this option some serious consideration. Disclosure: I am/we are long SCHD. I wrote this article myself, and it expresses my own opinions. I am not receiving compensation for it (other than from Seeking Alpha). I have no business relationship with any company whose stock is mentioned in this article.